Index to the Bulletin of Industrial Archaeology in CBA Group 9 Has this entry, indexing issue 8 page 14, issue 9 page 16 etc. 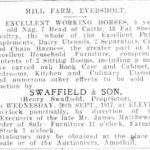 An attempt, which appears to have a fair chance of success, is being made to rescue the machinery of the 19th century Horse Mill at Mill Farm, Eversholt (SP988321). The mill was recorded last Autumn by J. Kenneth Major. The Museum of Milling at Billing Mill (SP 813 611) has proved very popular … the open space between the mill and the extension should be sufficient to install the horse gear from Mill Farm, Eversholt (SP 988 321) which is now ‘stored’ in Mr. Goseltine’s garden at Whipsnade. Report of Exhibition – ‘Horse and Man’ at the Abington Museum, Abington Park, Northampton, held from 26 January until 7 March. The horse-wheel from Eversholt Mill (see Bulletins No.8, p14 and 9, p16) is being re-erected by the Northamptonshire Industrial Archaeology Group at the Museum of Milling at Billing Mill (SP814611). Members of the group prepared drawings of the brick walls and columns and timber beams necessary to support the horse-wheel and these were erected by the Billing Aquadrome Company. About twelve members helped to lift the upright shaft and the larger gear wheel into position and fix the top bearing to one of the wooden bearings. The bottom of the upright shaft was supported in an old stone-spindle cup bearing which was packed up in position until the upright shaft was truly vertical. Later, this cup-bearing was cemented into position in the ground. Assembly of the rest of the horse-gear is held up due to some of the bearings being incomplete when the parts were delivered to Biling (see Appeals, page34). 3. Bearings for Horse-wheel. G.H.Starmer, 17 Mayfield Road, Northampton, NN3 2RE, would welcome information on the whereabouts fo a set of cast-iron plummer blocks, with brasses to suit a 1⅝”/1¾” outside diameter shaft. The holes for holding down the bottom block should be approximately 8½” apart. These items are required for use in the re-erection of the horse-gear at the Museum of Milling, Billing Mill. The mill gets a mention (but no more) at wikipedia. The milling museum seems no longer to exist. There isn’t a website for it. Tripadvisor has a page for Billing Mill which is a pub (very mixed reviews) at NN3 9EX, and that is at the same place as the mill museum shown on this BBC page. A visit is probably needed. Northampton council planning department has a variety of planning applications for that postcode going back to 1995, but not for a museum-to-pub conversion, so it probably predates that. 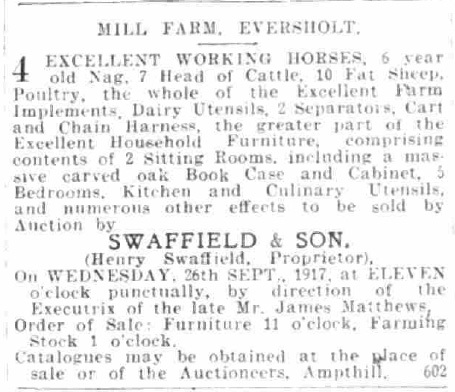 The contents of the farm were auctioned following a death.